The Cascade Mountain Range, National Parks and Wilderness Areas Of The Northwestern U.S.
Mount Jefferson, Jefferson Wilderness Area, Oregon Cascades, Oregon, copyright 1959 by Philip Hyde. The Cascade Mountain Range, a string of volcanic peaks and vertically thrust rocky crags, runs from Northern California through Oregon and Washington and into Canada. Land battles in the 1950s and 1960s over the lush forests of the Cascade Mountains in the Northwestern United States, helped shape future strategy for wilderness conservation campaigns across the nation. As the U. S. Forest Service and the timber industry, on one side, grabbed for more trees to mill, recreationists and environmentalists, on the other side, attempted to save their beloved woodlands, river valleys and rainforests from destruction. When enough public outcry supported the protection of an area, it became a National Park such as North Cascades or Olympic National Park. However, just obtaining wilderness status for many wild areas engendered a terrific political and often legal war. 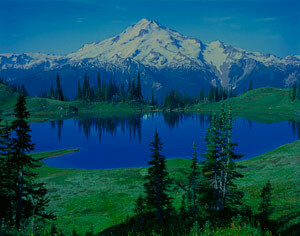 The Mount Jefferson Wilderness Area became one of the many controversies of the 1960s. Mount Jefferson is Oregon’s second highest peak (10,249 feet) behind Mount Hood (11,497) and not to be confused with the Mount Jefferson in Montana, or in Utah, or the mountain bearing Thomas Jefferson’s carved likeness in North Dakota. Mount Jefferson of the Central Oregon Cascades is surrounded by plentiful lakes, steep raging rivers and lush river valleys riddled with gold and silver mining claims, cattle grazing and thick stands of mixed conifer trees. In 1959, after conferring on strategy and partial funding with David Brower, Executive Director of the Sierra Club, Philip Hyde hired mountaineer and wilderness guide Fred Behm as a horse packing guide. 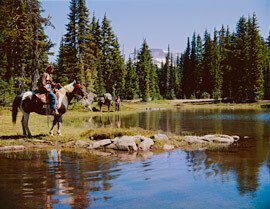 Fred Behm led Ardis and Philip Hyde by horseback pack trip into the Mount Jefferson Wilderness Area. 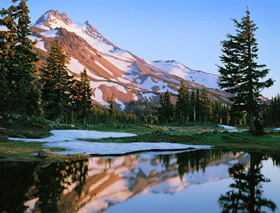 Philip Hyde made photographs for use by the Sierra Club and local Oregon environmental groups working to attain permanent wilderness designation or national park status for the Jefferson Wilderness Area. Mount Jefferson Primitive Area, one of the largest in Oregon, formed in 1930. It stretched across the Deschutes, Mount Hood, and Willamette National Forests. Each of these National Forests helped manage the primitive area. Lumbering slowed significantly during the Great Depression, but took off again during and after World War II. In the Willamette National Forest, the volume of logs cut more than quadrupled between 1945 and 1955 and continued to increase for decades. The Forest Service began to reclassify many primitive areas as either multiple use or permanent wilderness without any input from locals. Frequented by hikers, fishers and small boaters, Mount Jefferson Primitive Area had some of the highest recreation levels of any wilderness in the Northwest, second in Oregon only to the Three Sisters Wilderness to the south. In the early 1960s, the Forest Service was using its administrative powers to decide how much land it wanted to put into its new wilderness system. Wilderness areas in this system would have carefully considered boundaries and would be permanently managed as wilderness, without roads or logging. In contrast, primitive areas, which had been set aside earlier under regulations of the 1920s, allowed some roads, had boundaries drawn with little study, and were only provisional in nature. In response to pressures to better protect primitive areas, the Forest Service had decided to either reclassify them as wilderness areas or to drop the provisional protection it had accorded them. When reclassifying the Three Sisters Wilderness, the Forest Service dropped 53,000 acres from the wilderness area. After a 25 year struggle from grass roots activist groups and conservationists, Congress finally added 45,000 of these acres back into the Three Sisters Wilderness in 1978, part of which consisted of the west side of beautiful Waldo Lake. The technique involved sampling the core values of the area (via a backpacking trip, a horse pack trip, or an overflight); driving every road to the edge of the wilderness area; looking at every peripheral development; evaluating competing values and alternative uses of the resources found there…. People valued these areas for many reasons: to experience wild country, to see mountain scenery, to walk through old-growth forests, to hunt and fish in less crowded areas, and to simply get away from civilization. The Forest Service roads and clear cuts deep in the Whitewater Creek valley were powerful examples of why wilderness activists focused so much energy on codifying a wilderness system created and maintained by Congress. In the long run… the Wilderness Act resulted in a massive increase in the acreage of land protected as wilderness in the United States…. Following that mandate, the Forest Service reexamined the Mount Jefferson area, the first primitive area in the Cascades to undergo review under the requirements of the Wilderness Act. Expanding wilderness protection into more valuable, lower-elevation forests, however, carried too much additional cost to the industry…. The conservationists proposal would reduce the available timber supply to the local economy by eleven million board feet annually, Oregon Senator Mark Hatfield claimed, and ‘serious economic hardship could result….’ To add the forested areas proposed by conservationists would result in the loss of six hundred jobs in the local economy, regional forester Herbert Stone claimed. As a result, the Mount Jefferson Wilderness Area, as approved by Congress in 1968, did not include the Whitewater Valley. Even though the final boundaries of the Mount Jefferson Wilderness Area did not include the Whitewater Valley, conservationists did succeed in persuading Congress to include other expansion areas such as Marion Lake and a few other tracts of undisturbed forest. To learn about how conservation strategy in the Cascade Mountains had national impact and to discover more on how Cascade Mountain wilderness battles helped environmentalists refine their message into the Wilderness Act see the blog post, “The Oregon Cascades’ Impact On Conservation.” Also, discover more about the protection of the Cascades Mountains in blog posts to come, particularly the creation of North Cascades National Park and the protection of Glacier Peak Wilderness, both in the state of Washington.